This book is a spirited contribution to scholarship on gender and migration, feminist development studies and labour studies. Leah Briones’ ambitious project combines theoretical debates over ‘structure and agency’ with fieldwork exploring Filipina experiences of domestic work in Paris and Hong Kong. Using feminist ethnographic methods, Briones conducted twelve interviews in each setting and participant observation/observer participation, and worked with non-governmental organisations. Her discussion draws on francophone and anglophone literature, rigorously reviewed, to problematise stark characterisations of migrant women as either ‘victims’ or ‘agents’ by carefully situating migrant women's labour within the global political economy and connecting the different sites and scales through which power operates and agency is exercised. The fruit of this endeavour is her ‘capable agency approach (CAA)’ in which ‘agency requires capability to successfully mediate victimization; agency itself is insufficient’ (p. 4). Her focus, then, is not on what conditions make migrant women's agency possible, but what makes it capable (p. 65), to do and be (p. 166). The book is particularly strong in the second half (Chapters 5–8) when the sophisticated theoretical framework is connected to women's voices. Here Briones challenges theoretical assumptions by using meanings of agency provided by women who participated in the study. She finds that for Filipina overseas domestic workers (whom she refers to as FODW), rights are more appropriately understood as economically rather than politically oriented, ‘ultimately defined in the context of a transnational livelihood strategy for the purposes of sustaining families and projects back in the Philippines’ (p. 80). In contrast to migration studies literature in which migrants seek to obtain overseas employment, FODW employ understanding and application of rules and resources to remain in overseas employment. 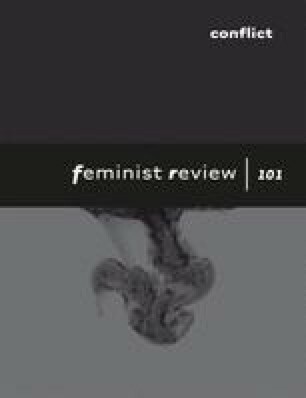 Participants view constraints ‘as a threat to their agentic orientations toward earning a livelihood’, pointing to the need to revise feminist agency accounts that do not sufficiently emphasise poverty (p. 135 and Chapter 6). Access to different types of resources is essential—not least the resource of overseas domestic work employment itself—and vulnerability stems not only from violent and constraining forces, but also the threat of ‘de’-transposition of women's schemas back to the Philippines (p. 160). More use of respondents’ insights in conjunction with theoretical claims would make the book's argument even more powerful. This move could also forestall critique of what might appear to be Briones’ excessive optimism, in the face of the constraints that she explores so meticulously, about the capability of FODW to transform structures and alter structural conditions (an optimism that I share!). There is also fruitful ground for future dialogue with human rights scholarship. The book claims that ‘rights are not enough’ and posits an opposition between, on the one hand, human rights and, on the other, livelihoods and development (e.g. ‘protecting FODW human rights doesn’t guarantee livelihoods, but protecting their access to resources for a livelihood creates the opportunity or capability for securing rights’ (p. 178)). Many rights scholars and activists would claim the capability to earn a livelihood as part of the struggle for social and economic rights, and argue for the desirability of this language and politics to ensure that social and economic concerns are addressed within an international regime that has historically privileged civil and political rights (some take the further step of elaborating a ‘right to development’). Access to resources and securing livelihood would therefore fall within the discourse and practice of rights, rather than in opposition to it. In turn, scholars of citizenship and human rights have long called attention to the vexed question of the relationship between rights and membership of specific, territorially defined political communities. A productive dialogue could take place here that would expand and deepen Briones’ claim that the issue of rights for FODW is more accurately identified first as an issue of capability rather than rights, and that it should be defined and championed politically as such (p. 178). The book concludes with a call for action that I hope Briones will develop in future work. She proposes new political strategies that frame overseas domestic work migration as connected to development. Researchers can contribute to this framing by highlighting the oppression of migrant domestic workers as both a migration and development issue. Politically, this means ‘moving the issue of livelihoods away from border controls, focusing less on the right to protect borders and more on the right to development for the purposes of livelihood and human security’ (p. 176). These are important considerations for feminist scholars of migration and development who are concerned about the impact of their work beyond the academy. Empowering Migrant Women is a thoughtful contribution and an excellent addition to courses on gender and women's studies, globalisation, labour studies, development studies and migration.